As promised, this is a card using the same design that I used yesterday with very different results. I also like to make the inside of my cards nice too. 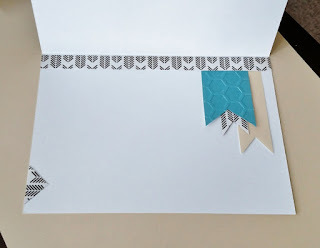 I used some of the leftover scraps from the front of the card to add a special touch to the inside. Thanks so much for stopping in again today. The car looks great you're right a very different look. I love the inside of the card too. Well done! What a beautiful card, Pamela!! I so love the textured and embossed background and your popped up flower!! Your design is so soft and elegant. Thanks for joining us at ODBD! !